McQuay signed a reserve/future contract with the Chiefs on Friday, according to the league's official transaction log. Analysis: McQuay didn't appear in any regular-season games for Kansas City in 2018, but he did spend time on the team's practice squad. He'll now get an offseason to carve out a role in the secondary that has defensive backs Ron Parker, Steven Nelson and Orlando Scandrick set to become unrestricted free agents. McQuay was waived by the Chiefs on Tuesday. Analysis: McQuay was promoted to the Chiefs' 53-man roster prior to their Week 6 loss to the Patriots in order to provide depth at safety. Assuming he clears waivers, the 23-year old will presumably return to their practice squad. McQuay was promoted to the Chiefs' 53-man roster Saturday. Analysis: McQuay failed to make the Chiefs' final roster prior to the season kicking off and reverted to their practice squad. His addition to the active roster is likely due to starting strong safety Eric Berry (heel) being doubtful for Week 6 and backup Eric Murray (lower leg) being ruled out. McQuay will presumably back up Josh Shaw heading into Sunday night's game against the Patriots. McQuay (hamstring) returned to practice Monday, Brooke Pryor of the Kansas City Star reports. Analysis: McQuay has been sidelined since Saturday due to a minor hamstring injury, but was back in full pads Monday. With fellow free safety Daniel Sorensen (knee) out for at least the next six weeks, McQuay could find a role with the first-team defense if he's able to remain healthy. McQuay was sidelined for Saturday's practice due to a hamstring injury, Brooke Pryor of The Kansas City Star reports. 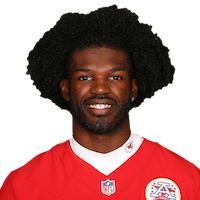 Analysis: McQuay was signed to the active roster from the practice squad in December of last season to give the Chiefs some added depth in the secondary. If the injury is somewhat serious, it could impact his chances of making the team's final roster this season. The Chiefs signed McQuay to the 53-man roster Monday. Analysis: McQuay was selected by the Chiefs in the sixth round of this year's draft but has spent the entire season on the practice squad. He'll provide Kansas City with depth in the secondary after Steven Terrell (undislosed) was placed on injured reserve Monday. There are no videos available for Leon McQuay III. Click here to view all videos.